Below are all the poems that I have written in my life. (About 2400 to date) I have degrees in Political Science, Accounting and Law. Not English. There are some poems missing no doubt but I have been attentive to keeping all my peoms together. After trying for literally decades to get them all typed and edited without success, due to life intervening circumstances, I decided to scan in all the originals and then work on the typing as I found time. There are some typed poems at the beginning of each year. I have always considered the cursive originals as works of art, as writing in one's own hand is a unique work of art. 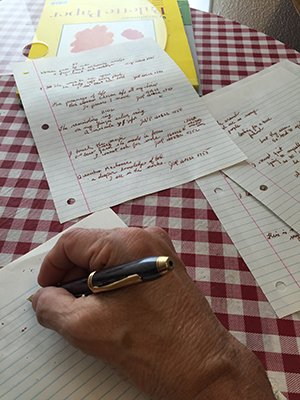 Handwriting experts can interpret the changes in me over time if they are so inclined or inspired. I don't know if any other poet has made his or her originals public. The internet is a wonderful miraculous thing. What you will notice is that poetry is not a struggle for me. It never was. A thought comes and I write. I never try to write when I am not inspired or called by the muses to write. The poem will not flow if I am not in that creative space. The only corrections I make are typically to clarify what I have scribbled (literally). I have been writing a long time and I know how to connect to the source of these poems. This ability has flowed over into my art. I see the art in my mind, dreams, visions and then I draw then paint. Sometimes the art is crystal clear and sometimes foggy and I have to work at bringing it into reality. But like with the poems I don't try to move the art forward until I am clear what is to be done. Sometimes I have waited years to finish a painting. Not due to a creative block but due to the fact that I have many other interests and self set objectives and goals in this life. Generally I write a poem in less that a few minutes. Every original poem is the first only copy. I don't rewrite and destroy the first impression. If one does not have a passion for creating something, quilts to poems, houses to paintings then what is created I think will be flat. I am passionate about poems, haiku, writing, art, my web design business and my WorldPeace Advocacy, my Candidacy for President 2020.. I am riding all these horses all the same time. Maybe they are riding me. So I have opened up my creative process to a public view, defects and all, for the purpose of allowing other would be poets to see the perspiration and passions and long term commitment it takes to hone ones vision. And know that that honing only stops with physical death. Some years I wrote hundreds of poems. Some years nothing. I had no desire to create some kind of world record in poems written even though I could do that. Instead my poems relate to my thoughts and a call to write. Without the call I only on very few occasions tried to see how deep the well of inspiration. I saw that well has no bottom. It is truly infinite. I have written about life. My life. My thoughts. And as a result I have created something unique with my poems. Not great and not trash. But just branded by me. I have no organization. No followers, no disciples. I am just one man living his own bliss. And my greatest ongoing bliss is dancing between this physical reality and the spirtual side which is a knowing but at times an undeniable miraculous tangible event where those spirits from the other side who are the very necessary helpers assigned to every single incarnate human being, make their presence know; actually their love known. Jesus did not die. How ridiculous. No one dies except in the body. Jesus just embraced the whole human race such that at every moment he is ever present with every single human being, whether he is ignored or not, with a profound and infinite love. Ask and receive. Seek and find. Knock and enter. Whatever you ask will be given. The more the intense emotion of the desire the faster the manifestation. Confusion in the manifestations of this reality exists when one believes that this finite mortal existence is the true reality as opposed to the infinite immortal reality of God. This is what the poet and artist and other creators bring to this earthly party. A glimpse of our infinite home made of indescribable beauty and love. A beacon to the true reality. 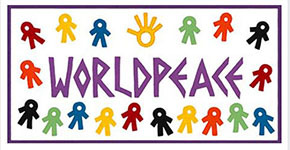 I changed my name on April 1, 1988 to John WorldPeace. So the poems prior to that date are signed in some variation of Ken. April 1, 1988, was both April Fool's day and Good Friday. Interesting.